Monica Obando: Helping you to find peace and inspiration in an over-stimulating world! Some people have a particular involuntary subconscious urge to pull their hair from their scalp, eyebrows, arms, etc; this action is sometimes so overwhelming that the person pulls quite a handful of their hair. This urge to pull hair is known as Trichotillomania. What Causes Hair Pulling in People? There are several reasons why a person would have Trichotillomania; for some it’s a focused action that helps them relieve emotional anxiety and stress. For others, the act of pulling own hair, nail-biting and chewing their lips is a subconscious sign that they exhibit when they are contemplating on a difficult project at work. Hypnosis for many people is a mysterious and somewhat outlandish concept that involves mind control. The mainstream popular culture portrays hypnosis as a mind control tool that the hypnotist can use to control the mind and bodies of their victims. Unfortunately, the reality of hypnosis is quite the opposite -- there’s no mind control involved! Sorry to ruin your urban myth! Did you know that hypnosis has a way to improve your emotional health? It has the ability to change how you think. Experts use hypnosis to awaken your soul to help eliminate your irrational fears that over time turn into phobias. When left untreated, these fears can take over your mind preventing you from enjoying your life to the full. With hypnosis, you will get a chance to address your inner fears. You will learn to overcome your phobias and be more productive and active. "When left untreated, fears can take over your mind preventing you from enjoying your life to the full. With hypnosis, you will get a chance to address your inner fears. You will learn to overcome your phobias and be more productive and active." And of course, you should absolutely Download My Free Cheat Sheet for Success & Start Getting More Peace of Mind! Did you know that your mind could turn on you and become your worst enemy? But fear not, because hypnosis is your way out of your problems. Hypnosis therapy when performed by an expert will change the way you perceive things around you. The change in your perception will help you get the whole picture. Hypnosis has the power to tap into your subconscious. This allows the hypnotherapist to help you overcome all the wrong perceptions you’ve held. It’s time to work on your self-esteem, you will start to believe in yourself and your abilities. Hypnosis therapy is a way to reduce your emotional anxiety, which allows you to become creative and at ease with yourself and your surroundings. 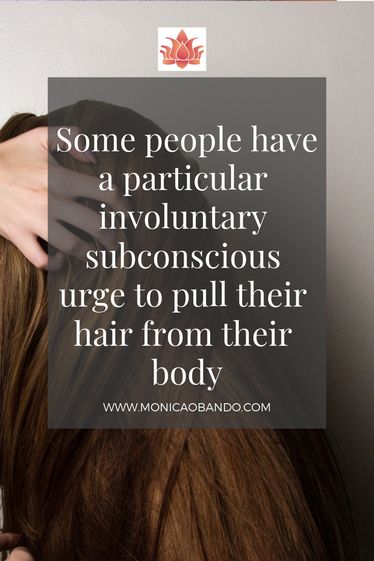 "Some people have a particular involuntary subconscious urge to pull their hair from their scalp, eyebrows, arms, etc; this action is sometimes so overwhelming that the person pulls quite a handful of their hair." How did Hypnosis help With My Trichotillomania? When I was about 16 years old, I decided to grow my hair. Within a few months, I had long shiny hair and I loved it! There were days when I would style my hair and admire it by touching the braids or the ponytail. But as I grew older my ‘hair play’ was something that everyone started noticing, because it continued way into my adulthood. Everyone who knew me started to point out that I constantly pull my hair and it would get worse when I would be emotionally anxious or emotionally depressed! I would pull my hair hard right from the scalp and there were times when I started to pull my eyebrows. And I did all of this subconsciously! I wasn’t aware of the fact that I pulled my hair so hard especially when I was stressed or emotionally anxious. 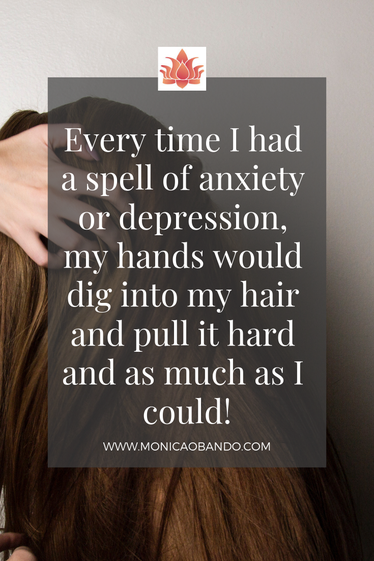 Every time I had a spell of emotional anxiety or depression, my hands would dig into my hair and pull it hard and as much as I could! Strangely enough, the pain brought me relief and comfort because… maybe it helped me focus my attention away from the pain in my soul towards physical more relatable pain. I wanted to get rid of my hair-pulling habit because it was starting to affect my relationships. I couldn’t keep a steady relationship because of my depression and the constant hair-pulling. Every time I had a bad day, it became so extreme that I was covering my head regularly because I had pulled most of my natural hair away! To stop myself from pulling my hair, I had shaved it off completely and started to wear wigs. And even then it didn’t stop me from pulling off the hair from my eyebrows! I really needed to get rid of this habit and I was looking for treatments. One day scrolling through my Facebook, I saw a post from Monica who provides treatment for hair-pulling and other issues. I joined her page and left her a message. I was given my appointment. On my scheduled appointment, I walked into this cozy looking office. The receptionist was kind and she guided me to Monica (the hypnotherapist). During my first visit, she told me about hypnosis and how it works. I was surprised and somewhat shocked to know that I had a hair-pulling problem that’s deeply rooted in my subconscious mind. To be very honest, I didn’t believe the "therapist" or the hypnosis language she spoke but out of curiosity, I decided to go ahead with the treatment despite feeling uneasy and skeptical about the entire thing. My first session was an eye-opening experience, I felt lighter like a huge load was lifted off my chest literally. The result of my first session encouraged me to continue and see where it leads to! After a few sessions, I was able to understand why I do what I do. 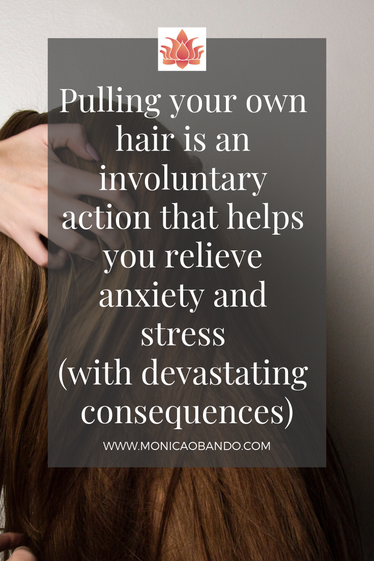 Hair pulling for me was a way to fight off stress and over time it became a dangerous habit that I couldn’t get rid of. I learned how to fight my emotional anxiety with an open mind and look for other options to get my frustrations and negative energy out of my system. I must say it hypnotherapy helped me become a better person; I was able to change how I think and behave. Hypnosis is a method used by experts to tap into the subconscious mind. The practice is widely used and promoted by both British and American Medical Associations. 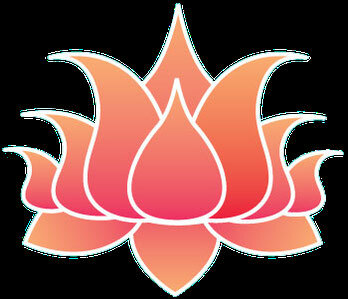 Hypnosis therapy or hypnotherapy has a number of benefits that can help transform your life. Don’t hesitate to contact me if you feel emotionally anxious or emotionally depressed. Hypnosis can help you grasp your subconscious mind to become a happier, better and more active individual. Ready to take your life to the next level? Get instant access to the 7-Day Plan to Beat Your Emotional Anxiety Class! YES, You can transform your life! Join the revolutionary holistic group to walk away your anxious feelings and learn more about yourself! Click here to setup your Hypnosis appointment today! Click here to setup your Hypnotherapy appointment today!